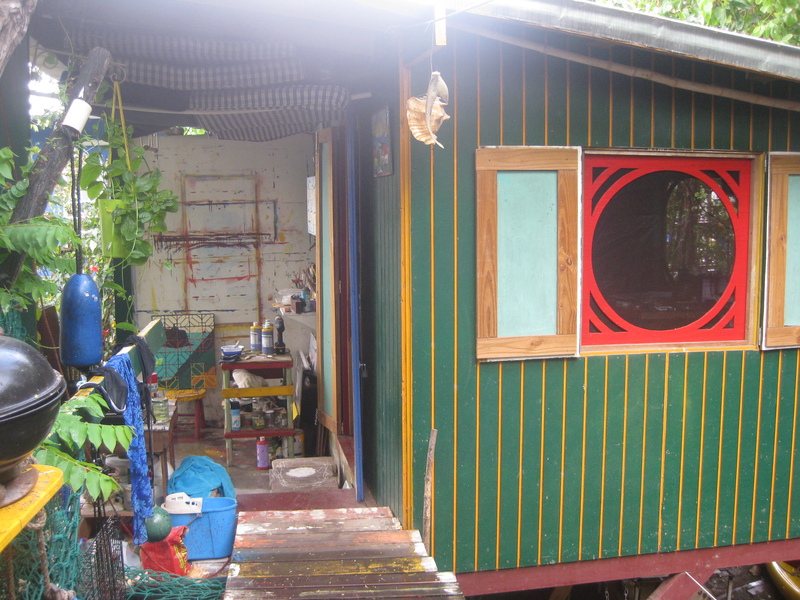 If you’ve been reading this blog from the beginning (first post was way back in November 2010, eons ago in internet time) you may recall that I have a thing for tiny houses. Anti-McMansions. Cutie cottages. 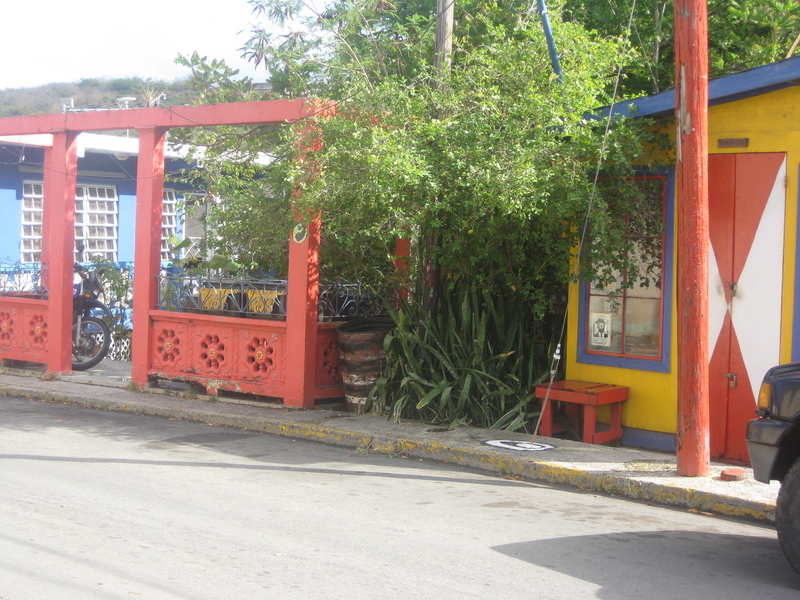 Casitas. You get the picture. I haven’t posted for a spell, because I’ve been away. Again! This time for a blissful family vacation packed with snorkeling, body surfing and plenty of afternoon snoozing in hammocks on a little island off the coast of Puerto Rico. 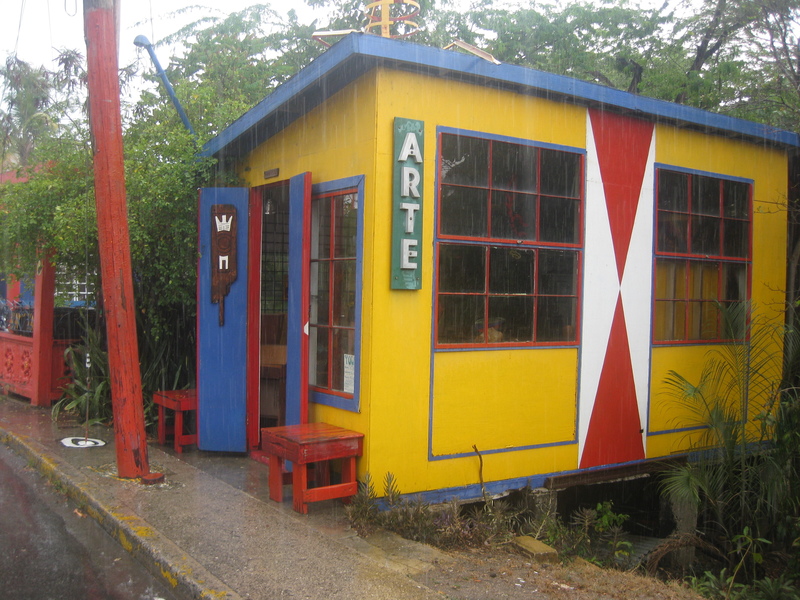 While we were there, we visited our talented friend Jorge Acevedo, an artist and musician who has a shop with a tiny accompanying tree house type of living space. A suspended wooden platform connects the shop and living areas. The structures are lived-in works of art. 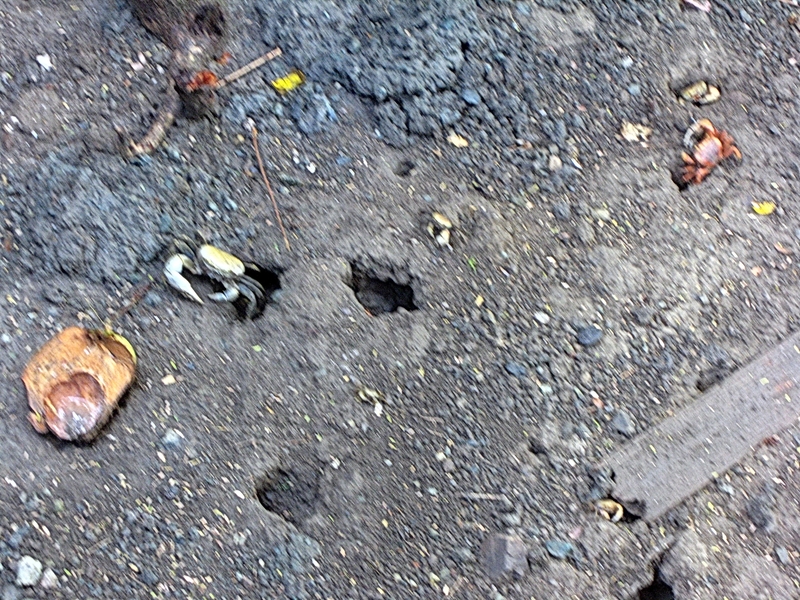 The backyard, peppered with holes made by dozens of land crabs, slopes down to a canal. When you enter the shop, you see a simple, calming interior. The doorway to the left leads to the tree platform kitchen and living quarters. 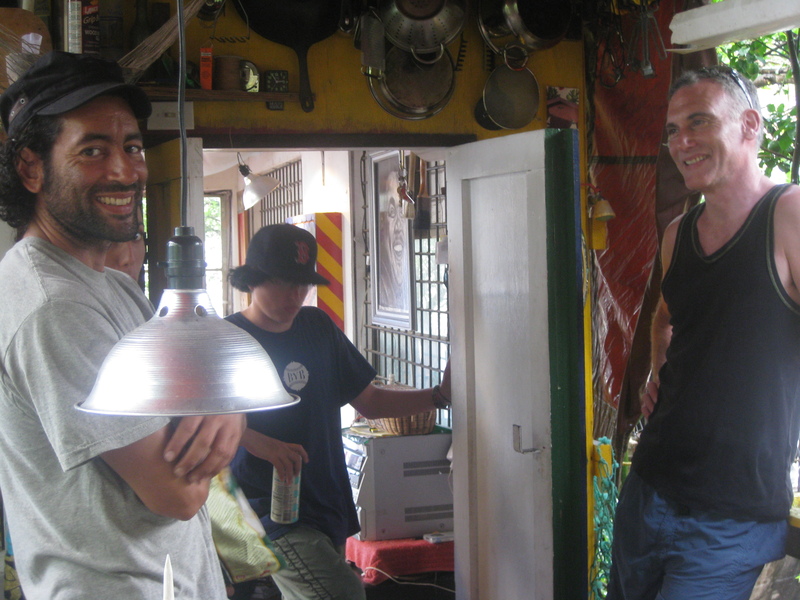 Standing in the kitchen area, you can look out into the shop and see what’s cooking in both places. Work, play and life: all perfectly combined. But privacy and quiet are often in short supply. A popular bar and restaurant with outdoor seating on the canal is on one side. The narrow street echoes with motor traffic and people, especially once the bar closes. 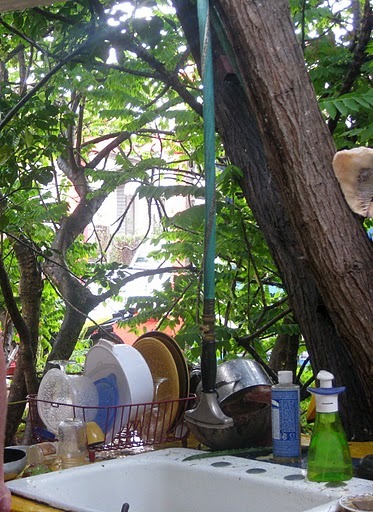 The land crabs serve as miniature living garbage disposals for the bits of food scraps that Jorge tosses down from his outdoor kitchen, perched under the branches of a mangrove tree. The less than one-acre lot is filled with red mangroves. The trees’ aquatic roots serve as a precious water filter and nursery for fish. 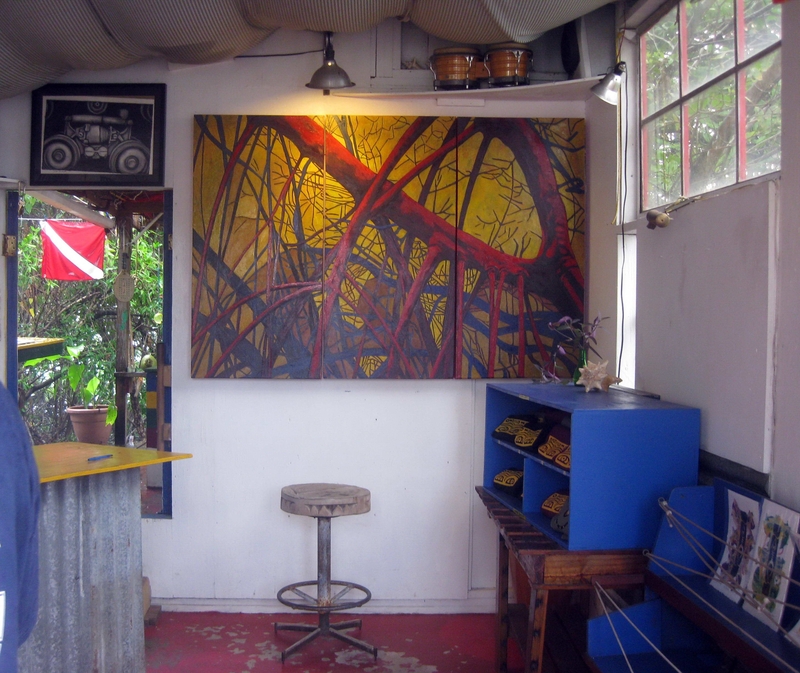 The mangroves are also a source of inspiration for Jorge, whose artwork and living space often feature the twisted roots of these trees. The future of this island is intertwined with the mangroves’ roots, and is just as tangled. While some residents welcome development for its economic benefits, others fear its long-term impact. In the see-saw balance between development and preservation, I’m praying that preservation prevails—otherwise there will soon be nothing left of the delicate coral reefs, sea turtles and other wildlife on this magically uncrowded place, a place that natives and visitors cherish. Jorge told us about CORALations, a group trying to save the Caribbean’s coral reefs, through advocacy, reef restoration and research, and education. Please write to Mary Ann Lucking at info@coralations.org to make a tax-deductible donation and learn how you can help save coral reefs throughout the Caribbean. That’s really beautiful. Here in Manhattan I feel like we’re doing a sort of urban equivalent of the micro-housing thing. There’s a fun aspect to the challenge – if you have the stomach for it. And sometimes I think of the analogy of “If you can sing it well quietly, you can absolutely belt it out” and hope that somehow the analogy holds here. hi Daniel – thanks for reading and for commenting on this post. There’s quite a few of you micro-housers around the world 🙂 I know from experience that you definitely need to be much more selective about what you acquire and hold on to when you live in a smaller space. I never believed in paying for extra storage space, but that’s a weird Yankee trait of mine, perhaps.